Drivers crossed the Longfellow Bridge Monday from Cambridge into Boston. Many said their drives were far from smooth on the first weekday commute on the span, which is being repaired. As Sal Spinetti made his way to Massachusetts General Hospital shortly after 8 a.m. Monday morning, Charles Circle was a cacophony of car horns. As he had on many other mornings, Spinetti had encountered traffic on his trip across the Charles River from Cambridge. But Monday’s traffic was different. 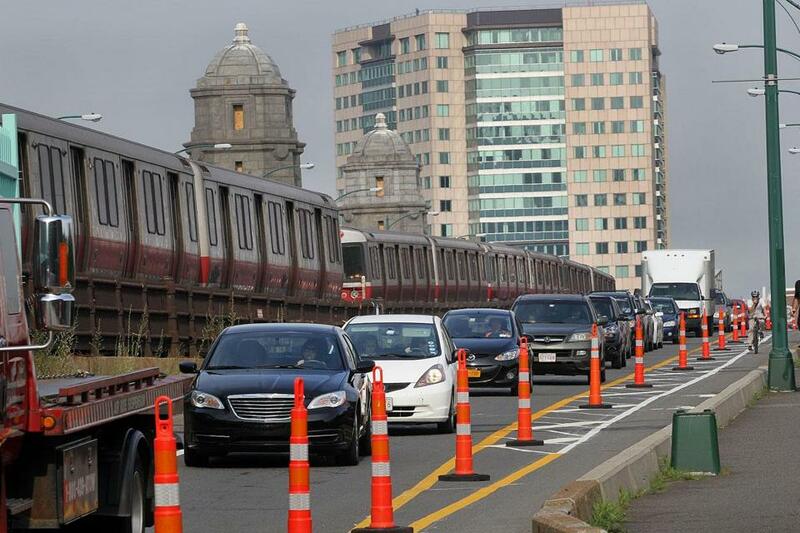 It was the first workday commute after the partial closure of the Longfellow Bridge . For the next three years, no cars will be allowed to cross it from Boston to Cambridge, and for now, vehicles coming into Boston are using the opposite side of the bridge, a change that seems destined to create traffic nightmares for many commuters. “It was better than I expected, not too bad,” Spinetti, 55, of Cambridge said as he waited for a traffic light at Cambridge Street to turn green just after 8 a.m. Though Spinetti did not have to endure much traffic, many other commuters said their morning commutes were far from smooth. Officials, however, said the traffic seemed to flow well. The lane closures and new traffic pattern mark the beginning of a $255 million project to rehabilitate the bridge, which is more than 100 years old and famous for its salt-and-pepper-shaker towers. The work is expected to take about 3½ years. On the first day of the partial closure of the bridge, there was some confusion but no chaos. “I guess we’re all going to have to get used to it,” Spinetti said. Michael Verseckes, spokesman for the Massachusetts Department of Transportation, said it may take a few days for drivers to get familiar with the new traffic pattern and make adjustments. The Longfellow Bridge, originally the Cambridge Bridge, was completed in 1908 and renamed in 1927 to honor poet Henry Wadsworth Longfellow. 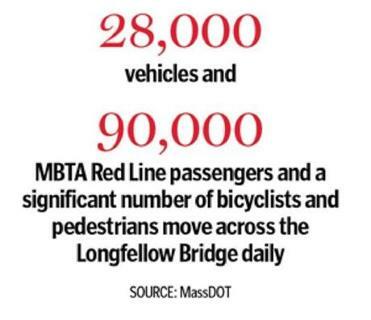 Each day, the bridge accommodates 28,000 vehicles, 90,000 MBTA Red Line riders and a “significant number” of bicyclists and pedestrians, according to MassDOT. By 9:30 a.m. Monday, many drivers said they were running late and had spent too much time sitting in traffic. Other drivers said the signs detailing the detour only disoriented them. For at least the next two weeks, officials from MassDOT, Boston, Cambridge, and others will meet daily at 10 a.m. to discuss the previous 24 hours of traffic, Verseckes said. Using traffic cameras and field observation, MassDOT may decide to tweak the traffic pattern if needed. “If we don’t feel that drivers are acclimating, we may make changes to the signal timing and the painted lane markers,” Verseckes said. 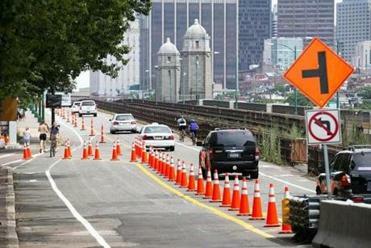 To help drivers become familiar with the new travel lanes, state troopers will be stationed on the Boston side of the bridge to explain new routes to confused drivers, bicyclists, and pedestrians. 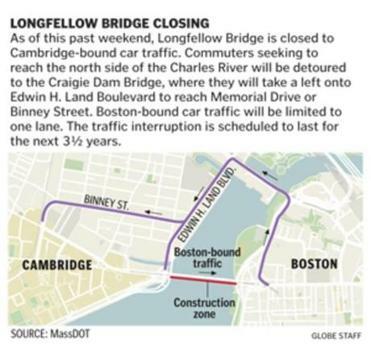 Traffic heading to Cambridge will be diverted to the Craigie Dam Bridge, next to the Museum of Science, and directed onto Edwin H. Land Boulevard to reach Memorial Drive or Binney Street in Cambridge. The Red Line will continue to cross the bridge on weekdays, on temporary tracks placed on the road while workers perform maintenance on the permanent rails. But for 25 weekends, the Red Line will not traverse the bridge, and riders will instead be shuttled via bus. The only modes of transportation that will have full access to the bridge throughout the duration of the construction are walking and bicycling, options some commuters said Monday that they are now more likely to consider. “I definitely won’t be driving,” Jenn Blazejewski, 34, of Cambridge said as she sat in traffic Monday morning. Colin A. Young can be reached at colin.young@globe.com.